When To Train With Others? | Mediterra - Swim & Run Better Than Ever! My long time friend (since 5 years old!) and I were debating the merits of training with others. Our conversation was about running, but when I composed my summary of our thoughts I realized this would apply to swimming as well, in the case of training for a particular event (rather than merely recreational or social swimming with no performance objective). 1 – Training with others is helpful, if not essential at some point, for some of our training needs. There is a form of power and motivation we experience in numbers, as we are social beings, and it can take us places we could not go on our own. There are aspects of training that are best done alone. And there are ways we can be pushed further only when we are training with others going in the same direction. Once we identify areas in our solo training that don’t take us far enough we should consider finding others who are going where we need to go and join them. 2 – The kind of training they are doing should serve our purpose or needs. If they are training with other priorities, other values or quite different events in mind, it might be nice socially, but it would be a waste of our time, or worse, counter-productive to what our bodies need to get ready for our particular event. 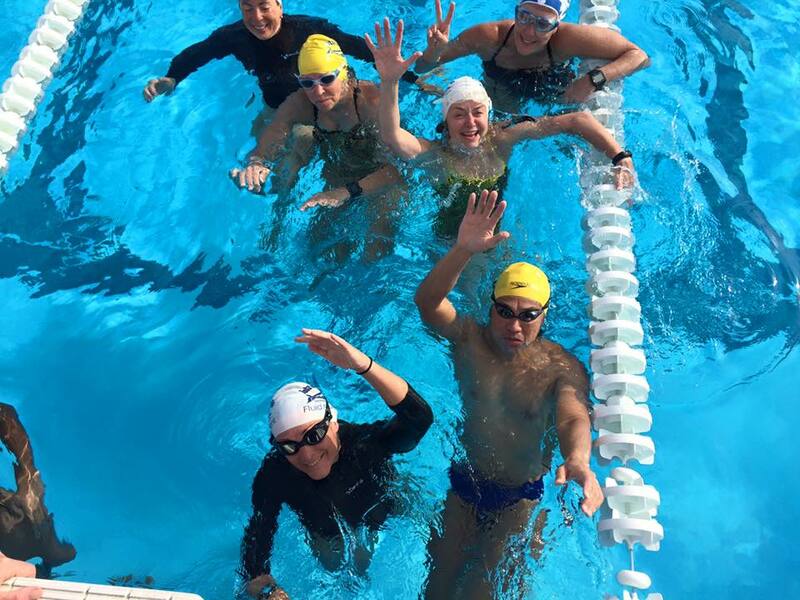 Masters swimmers, triathletes, and open water swimmers have water and the act of swimming in common, but their specific conditioning needs and skill sets may be quite different. If they are doing 200 medley (all four stroke styles) for pool competition and we are training for distance freestyle in open water then this is not specific to what we need to be working on. If we need to develop better precision in a part of the stroke before increasing load upon it, and they are doing sets to lay waste to their metabolic system, then that would be a distraction from what we need to do right now. But if this group is doing work that directly relates to the technical qualities and fitness we need for our event, then by all means, we should join them! 3 – Their training pace and volume needs to be within proper range for us. When running with others, one obviously must go at the same speed, unless running on a track, or short looping course where you can catch up again on each round. In swimming we may share a lane but fortunately, we do not necessarily need to swim at the exact same speed. However, we must consider the intensity and volume and duration of training – if we are truly going to do the same sets as the others we’ve got to be organized into lanes that can handle the same number of sets and send off times so we don’t inconvenience one another. For example, you may need to challenge a particular part of the performance system up to a certain point and then back off in order to prevent unnecessary recover expense, while the others may or may not be going as far or stopping when you need to stop. The practice set and the social expectations need to be set up to permit that. We’ve got three parts to the performance system to train: the metabolic, the muscular, and the motor (neural). Fuel is converted to energy (metabolism) is converted to power (muscles) in directed into precise action (motor). The design of our practice set needs to take into consideration the weakest member of that system – if not to strengthen it, then to avoid set-back or injury while focused on stressing another system. It goes best if everyone doing the set can benefit from it in the same way. The ideal is to find some training partners who are bit better than you at what you are working on, so you feel the pull to a slightly higher standard, a slightly higher effort than you would do on your own otherwise. And you have role models around you. If they are too far beyond your current abilities, after a while trying to keep up might become a discouragement to you and a drag to them. 4 – We have the wisdom to know when to let ourselves be pushed and when to ignore that external pressure from the others. There are times we can really benefit from having others draw us into an experience that takes us beyond our perceived limits, or at least pull us into that good and uncomfortable growth zone. While we may need the others to give us courage to go, each one of us still needs to be personally responsible for knowing this is good for us personally or not. There are times when we know that what they are doing is not in our best interest, or perhaps risky to our well-being or budget of energy and time. We need to trust our own wisdom, have the understanding of how to train, and exercise the courage to resist the peer pressure, to not do what we should not do. Each of these points could accept further qualification, but in general, they describe some of the tension between solo training and group training. And, everyone falls somewhere on a spectrum between those who prefer to practice with others, and those who would prefer to practice alone. If we find ourselves at either extreme, we may consider what advantages we might gain from adding a bit more of the other, if we can do it in a positive and productive way.